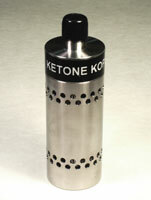 The “Ketone Kops” gas detector offers protection from dangerous concentrations of volatile organic compound solvents. Ketones are both toxic and explosive. This gas detector continually monitors gas levels in the protected area; flashing an alarm the instant concentrations reach a danger point. The security package plugs into any 120-volt outlet.